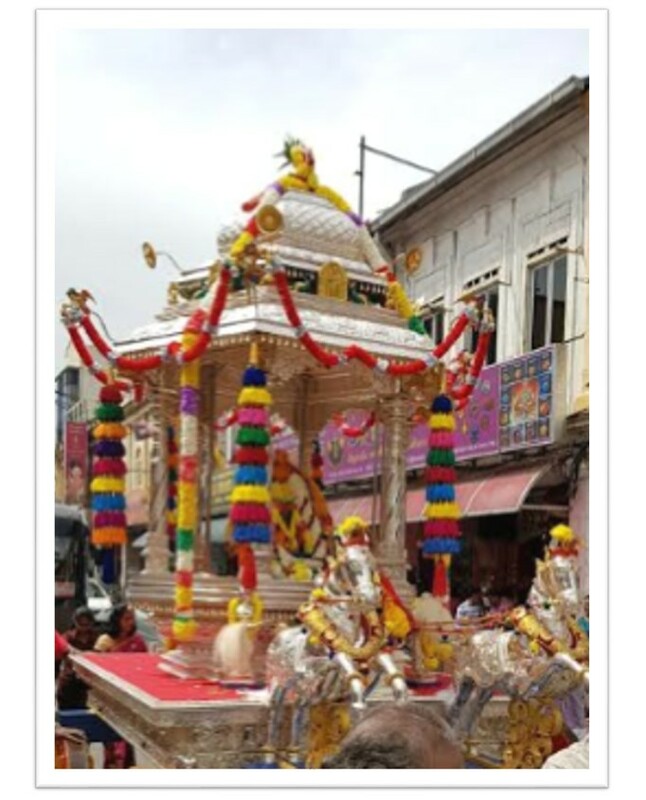 A friend sent me this picture of a sort of a procession that took place yesterday downtown Kuala Lumpur in the part of the city known as Little India. I have no idea what's the occasion, perhaps the blessing of a new chariot. It's a beautiful one, no doubt. Little India in Kuala Lumpur is located in Brickfields, a residential neighbourhood just outside central Kuala Lumpur. Brickfields as the name suggests used to be the centre for brick-making in the early days of Kuala Lumpur. In 1881, a flood swept through Kuala Lumpur, in the wake of a disastrous fire. These successive problems destroyed the town's structures of wood and atap (thatching). As a response, Frank Swettenham, the British Resident of Selangor, required that buildings be constructed of brick and tile. Hence, Kapitan Yap Ah Loy bought a sprawling piece of real estate for the setting up of a brick industry which would spur the rebuilding of Kuala Lumpur. This place is the eponymous Brickfields. Later the area was developed by Yap Kwan Seng, the fifth and last Kapitan Cina of Kuala Lumpur. As a businessman, he foresaw an increased demand for bricks in fast-growing Kuala Lumpur and established a kiln in the district. The area soon became the centre for brick-making in the early days because the whole area was a clay pit and good quality bricks are made from clay. Therefore, Brickfields became synonymous with good quality bricks. Brickfields also houses historical government quarters built during the British era which are under threat from rapid development. Brickfields is popular for its Indian food delights especially the unique banana leaf rice and thosai (Indian pancake made from fermented rice flour). 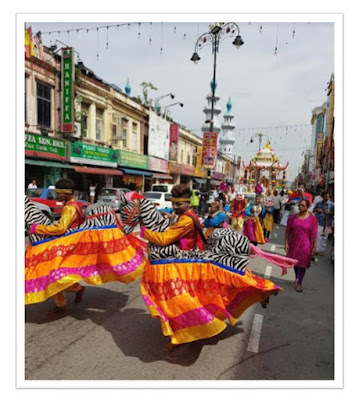 Also tagged as a "Divine Location", Brickfields is home to many religious structures, some over 100 years old, are concentrated in the area, particularly Jalan Berhala. The aptly named road ("Berhala" means shrine) houses the Buddhist Maha Vihara Temple and the Sri Sakthi Karpaga Vinayagar Temple. The Sri Kandaswamy Temple is one of the most prominent Sri Lankan Tamil or Ceylonese Tamil temple located along Jalan Scott. 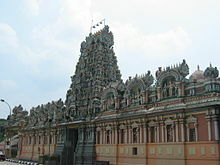 It is huge and showcases rich Tamil Architecture and has become a popular tourist attraction in Kuala Lumpur. This temple was built in 1902. A sprinkling of churches of different denominations can also be found here. Among the larger churches in the area are the Holy Rosary Church (est. 1903), Our Lady of Fatima, and the Zion Lutheran Church. Most of which are located along Jalan Sultan Abdul Samad. 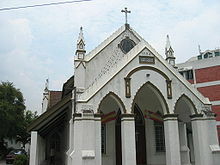 There is also an Indian orthodox church called the St. Mary's Orthodox Syrian Cathedral in Jalan Tun Sambanthan Satu. There is a Surau (small mosque) located on Jalan Sultan Abdul Samad called Madrasatul Gouthiyyah. This mosque is mainly attended by Indian-Muslims, and the sermons are sometimes conducted in Tamil. 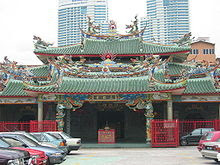 Finally, another major landmark in Brickfields is the 50-year-old Three Teachings Chinese Temple along Jalan Thambillay. Read more about Brickfields on Wikipedia. How to get to Brickfields and more..